Information sessions and community engagement opportunities coming this summer! Planning is underway for a first phase of improvements at Currie Park, guided by the Currie Park Master Plan, that was approved in 2016 by commissioners for the Minneapolis Park and Recreation Board (MPRB). This phase includes a new splash pad and improvements to the park's restroom building and playground. Community engagement is essential to help ensure that these improvements reflect the needs and desires of the communities who use the park. We hope you can attend an community engagement event to learn about the project and share your thoughts and ideas. Please help to spread the word to friends, family, neighbors and co-workers, too! Find out more about the project and get answers to questions you may have. Thursday, May 31, Noon to 1 p.m.
Wednesday June 6, 1 to 2 p.m.
Join MPRB staff at the park to share your thoughts and opinions about specific Phase 1 improvements, including the new splash pad and improvements to the restroom building and playground. Wednesday, June 27, 2 to 4 p.m.
Thursday, July 12, 4 to 6 p.m.
Saturday, July 28, 9 to 11 a.m. This summer, the wading pool will be removed in anticipation of the new splash pad to be constructed in 2019. However, the rest of Currie Park will remain open. 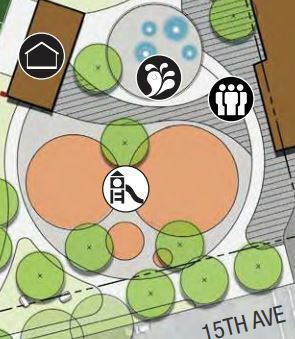 The plan for Currie Park is part of MPRB's master plan for all neighborhood parks in its south service area, approved in 2016. Find out more on the Currie Park Phase 1 Improvements project page.